Does you kid need a new winter jacket? If he does and likes Angry Birds then you should check this one out. This jacket is mainly red with black and has Red Bird on the front and even bigger on the back. And this jacket is fleece lined to be nice and warm and comes in sizes 4 – 7. 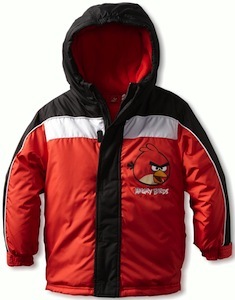 So Angry Birds fans check out this Angry Birds Boys Winter Coat.